...but I had no idea what would be in the box...Sara had mentioned she wanted to send something to the kids for the start of school as a way to say thank you to me for the clothes I had made for her little girl...(a thank you to me...can you believe that? She's the one who deserves to be thanked...profusely). So now...this is my challenge to you...is there anything that you can do to pay it forward somehow? Has someone done something amazing unexpectedly for you? Can you do the same for someone else? Sara...thank you. You rock. And so do tiaras. You are very lucky! I LOVE this tea towel, amazing! I love that tea towel too! How sweet to become friends! So I take it you have never met? Gonna go check out Sara's blog now! So... I noticed this morning that all of my wordpress subscriptions are gone. Ack! This makes me sad because in the past week, I haven't been notified of any of your posts! I added you back to my google reader until I can figure all of this mess out, but now it's time to catch up on your great posts! That was so sweet of her! There is nothing like receiving a box of goodies in the mail. 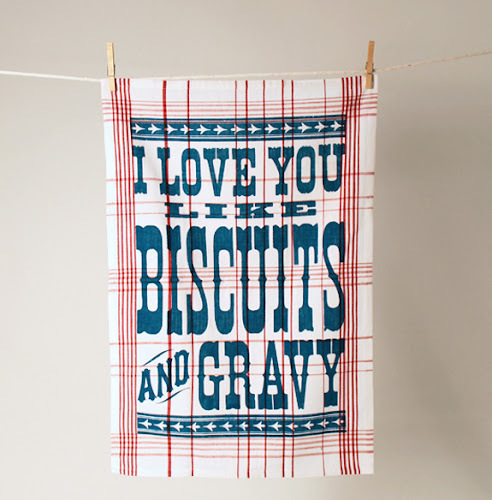 I love the tea towel... but I am dying over that vintage sheet....that is awesome! oh & if you ever would want some more vintage material, i've got more than i could use in a lifetime thanks to my grandma's stash! it's yours if you want it. i know you could do magic with it all. How fun is that? What a sweet surprise and I love that you paid it forward! What a sweet and beautiful gesture...loved all your goodies as well. Thank you for sharing this and how awesome that you are paying it forward and encouraging us to do so too. Love that! Sara ROCKS! Everything in that box would make my day...but all of it?! Wow.